Wonder why mobile monetization is still lagging as Kleiner Perkins partner Mary Meeker helpfully pointed out earlier this year? Well, one reason may be that many of the clicks on mobile ads are useless, the product of an increasing amount of fraud as well as a lot of inadvertent actions, said Trademob, a German mobile app marketing platform. The company, which is in the midst of opening offices in San Francisco and New York, shared some new research with GigaOM, finding that 40 percent of clicks are essentially worthless, creating a conversion rate to install an app from an app store of less than 0.1 percent. Trademob found that 22 percent of clicks are accidental, while 18 percent are fraudulent. That could be one thing holding back mobile advertising as some advertisers question how effective their spend is on mobile. Trademob — which aggregates more than 100 mobile ad networks and offers post-download conversion tracking to measure advertising efficiency — studied 6 million clicks around the world over six weeks earlier this summer. Click fraud appears to be a growing issue, repeating some of the problems that online advertisers had to deal with, Alexander Franke, COO of Trademob told me in an phone interview. He said mobile click fraud, which represented about 10 percent of clicks at the start of the year, falls into two main categories: server side and botnets/client side. Franke said 8 percent of clicks are created by an app publisher who uses a server to register false clicks. A more sophisticated problem is when someone deploys botnets on a number of hijacked devices to manipulate mobile click data. And in some cases, fraudsters hide one banner ad behind another getting credit for both clicks. These two methods account for 10 percent of useless clicks, said Franke. Trademob uses its tracking software to analyze the header data and IP addresses from clicks to identify suspicious clusters of activity. That can identify server-side fraud when the clicks come from the same IP addresses. For more sophisticated fraud, Trademob can identify when fraudsters generate clicks that don’t match the original campaign targeting settings. For example, Trademob will notice when a mobile ad campaign targeting iPhone (s aapl) users in western Europe, suddenly sees a lot of clicks from hijacked Android (s goog) phones in India. Trademob puts these publishers on a blacklist and won’t advertise on them. Accidental clicks are actually a bigger problem than fraud, but the rate of accidental clicks appears to be falling. Pontiflex ran its own survey with Harris Interactive last year and found that 47 percent of app users said they were more apt to click a mobile ad by mistake than on purpose. It’s not a straight comparison but Franke believes that accidental clicks are going down, in part due to larger screen devices which lower the potential for mis-navigation. But it’s not just fat fingers. Many shady publishers intentionally place big banner ads next to small buttons to induce accidental clicks, said Franke. Using its tracking technology, Trademob is able to identify the persistant bad publishers who yield extremely low conversions after the click and add them to its blacklist. These numbers are all generated by Trademob, who stands to gain by the awareness of useless mobile clicks. The company, which was founded in 2010 with funding from German VCs Tengelmann Ventures and High Tech Gründerfonds, has made its tracking tools one of its major selling points to customers. But Franke said Trademob has the best data around mobile clicks because of its sophisticated post-click analytics. The figures, if true, help explain some of the lingering challenges for advertising. With mobile usage exploding, there’s a growing opportunity for ethically questionable people to recreate click fraud methods on mobile, where defensive measures are less mature. This may add to the concerns of advertisers, who are still figuring out how much they want to spend on mobile. That can ultimately hurt legitimate mobile publishers and developers who are leaning on ad support to pay the bills. A good percentage of current mobile campaigns are CPI (Cost Per Install) focused. This requires not only a click but a completed download / install of a mobile app. If there is ‘so much’ fraud / accidental clicks then there would not be positive ROI for advertisers / developers – which is NOT the case. 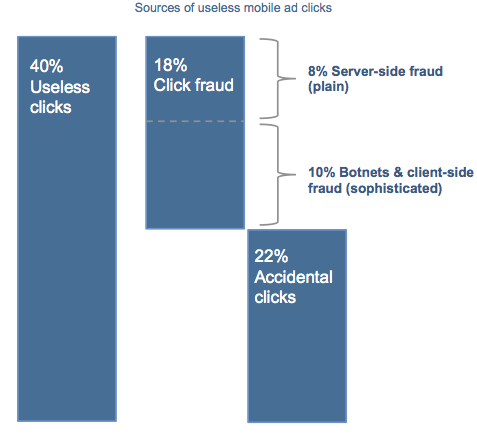 Is there SOME click fraud? Sure there is (look at online / desktop). Its a bad / sad part of the ecosystem. Are there SOME accidental clicks? Sure there are – and this is a unique challenge on mobile. BUT if it was 40% (I number I do not believe at all based on our data / experience) then CPI (performance and ROI focused campaigns) would never work on mobile – and they clearly do as this is such a large part of overall spend across the ecosystem. accidental clicks are more of a problem on smaller screens. It’s a shame the advertisers foot the bill for this, but in the end someone has to! But it’s good that it pops up sometimes to remind everybody that mobile advertising is a great chance but no silver bullet! 100% of my clicks are accidents. My 2 year-old grandson accidentally clicks his mother’s iPhone apps all the time. Kid games put the ads at the bottom of the page — where the previous and next buttons are located. 100% of my mobile ad clicks are accidental. I assume every ad I see is nefarious. I would guess nearly all mobile or home computer users see ads as punishment for not purchasing a pro version or otherwise using a free service. I’d sooner pay a reasonable price for a quality product than duck and weave around an onslaught of intrusive ads than use something published by an underhanded author whose revenue model is hidden and quite possibly built upon deception. Advertisers need to pay attention to this. Google is ripping them off. Sweet trademob ad-rticle. Read it on my mobile device btw. good point… the model is broken guys. My favorite timer app for use at the gym doesn’t offer and ad-free version. I end up misclicking all the time. That’s a very tough use case. I know my hand often shakes after a hard set. This explains Facebook’s mobile sponsored stories hoopla…no one really clicks those ads unless by accident. A very interesting and informative story. I visit a few mobile websites (one in particular, trib.com) that might fall into the category of ‘shady publishers’. The mobile website is perversely designed to force accidental clicks, something that is very frustrating to me and discourages me from going to the mobile site. I thought it (the trib.com mobile website) was just badly designed, but now I suspect otherwise. If what you see is the same as how http://m.trib.com appears on iPhoneTester.com – adsense ad at the top – I beg to differ. This Google mobile ad is standard. Mobile phone users will have to be wary of the ad at the top of mobile websites, if you don’t want to click. The mobile site of m.Trib.com seems well-designed. The desktop version had more click landmines than the mobile, but overall seems above-board and well designed, to me. @ i Multiscreen…thanks for allowing me to clarity. It is the m.trib.com website that gives me fits on an Android mobile phone. The upper 25% of the screen is devoted to their logo and tabs for ‘Latest, Most Read, Sports, etc’ The lowest 33% of the screen is devoted to more tabs, a blank space, and an advertisement. The remainder of the screen (about 40% give or take) has the headline for one story and another ad. It is within this confined space that the user is supposed to scroll to other stories. Clicking on the displayed story or trying to scroll is what produces (for me) unintended clicks. As for their recent redesign of the trib.com website, it is a welcome improvement. I would contrast the mobile trib site to that of the denverpost and nytimes, both of which are much friendlier to use. The link you provided to iPhoneTester.com is very cool, but apparently the iPhone version of m.trib.com is quite different than the Android version. Or perhaps iPhoneTester.com is running a simulation of the app, and not the mobile website?